WITH summer in full swing, holiday-makers from near and far have descended on the Gladstone region. 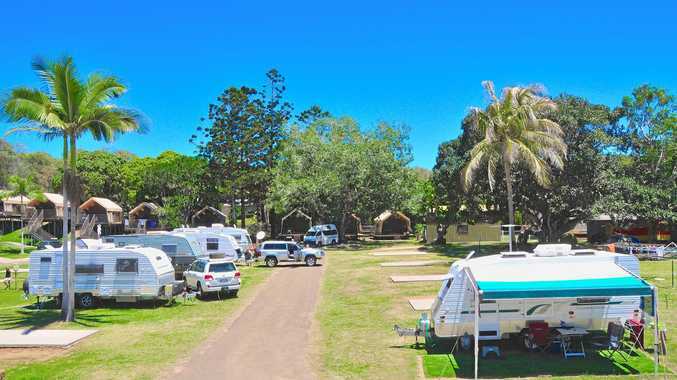 Gladstone Area Promotion and Development Ltd CEO Darryl Branthwaite said camping had increased as local and visiting campers took advantage of the school holidays, warm weather and coastal landscapes. Mr Branthwaite also said the number of Northern European visitors to the Gladstone region was increasing by 18 per cent a year on average, with the majority opting for a nomadic approach to their stay. "We're targeting the Europeans for a lot of things because they do come here for a longer break than the Asian market and they're a bit more of the freedom traveller, so they drive through the region and stay for two or three weeks," MrBranthwaite said. "They don't like huge amounts of crowds like the Gold Coast or the Sunshine Coast and they do like what we've got here." Caravan Industry Association chief Stuart Lamont said there was a record of more than 12million individual camping trips taken nationally this year. "The industry is estimated to have contributed over $20billion of economic value to the Australian economy, much of which importantly was distributed into regional Australia," Mr Lamont said. This year's figures from the annual Australian Bureau of Statistics Motor Vehicle Census revealed there were 3242 campervans and caravans registered in the region's 4677 and 4680 postcodes, up from 3123 last year. Mr Branthwaite said the influx of campers to the Gladstone region was definitely beneficial to the local economy as "activity breeds activity". "Our tourism operators are absolutely ready for it, hungry for it and are reaping the rewards of big visitor numbers and expenditure," he said. "There'll be all sorts of food and beverages and fuel and shopping. "People do save up to go on holiday, there's no doubt about that. "The tourism dollar does spread, it's probably the biggest multiplier you can get in the economic growth sector." He said camping as a holiday was "enormously" popular because of its cost-effectiveness and flexible nature. "There's a lot of places that you can go camping. You're away from everybody, it's a different climate and a beautiful experience," he said. "(Right now) all the caravan parks and camping areas down along the Discovery Coast will be full, there's no doubt about that." "I would say from Broadwater Haven right through to Workmans Beach and Agnes Water/1770, Tannum Sands, Boyne Island, they're all pretty full."